Spain’s EU harmonised seasonally-adjusted unemployment rate (which is the interesting number) went up again in July, according to the latest data from Eurostat. It rose to 20.3% from 20.2% in June. So despite a double digit fiscal deficit, Spain has not yet succeeded in putting a brake on the upward drift in the headline unemployment number. And the number of those officially working continues to decline, according to the data on those paying insurance contributions from the Labour Ministry. Clearly having broken the 20% barrier the number looks like heading up even further in the second half of the year, although quite how far up is hard to say, since my feeling is that some of the increase in unemployment is now being offset by the silent march of feet, heading for the door, and looking for employment abroad. That last paragraph is sadly so true. I’m a Spanish girl and I moved to Brussels just over a week ago to take up a post. That after two years job-hunting in my home country… where I sent 1,372 CVs in total and only got three interviews where I got insulted for being an emigrant returnee. Well it is funny you mention the door which has been silently inundated with the noise of the steps of people coming to work to Spain from abroad: one in every two immigrants to europe has come to Spain in the last ten years. Spain has more immigrants in absolute figures and in percentage of its working population than no other country in europe. 1) This is true but at the same time misleading. The Economist figures are foreign-born immigrants and Spain had virtually no immigration (except foreign retirees) till about 10 15 years ago. So there are few kids of immigrants in the workforce. Compare with UK and Germany with mass foeign immigration previously but their kids are now working so not-counted as foreign born immigrants. 2) Much of this immigration was peole coming to work in the construction industry. We know how that’s working out. 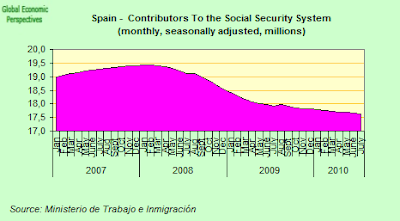 In the last figures i saw Spain was basically in equilibrium with regard to immigrants entering and leaving … I think we know why. Btw, you made a fair point about the aging graphs in a previous post. Unless you adhere to the policies of the National Front I do not see how can you find that statistic misleading: the descendants of immigrants are not immigrants, they are not “foreign born labour” they are home born and bred all sing and dance nationals. Spain has more foreign born labour than France, than the UK or than Italy, as an absolute figure and as a proportion of its labour force. Full Stop. Apparently, for Edward, the fact that some of these immigrants may decide to go back to their countries or that some Spaniards may become ex-pats, (as Edward is himself in Barcelona and many readers of this blog are in many places), seems to be something negative. Well, if that is the case then the opposite, the massive entrance of immigrants in Spain in recent years, or the fact that Spain is still number one in europe in that regard, must be very positive and must be a factor to take into account when deciding if Spain is ‘suffering’ from emigration or it is actually still a country with much more foreign born labour than the average in OCDE countries. Again it shows how spain is above the media in percentage of immigrants from eu or from outside the eu. most people moving to spain are desperate africans and Moroccans looking to access europe (spain is the doorsteps of europe), and poorly educated latin americans who can’t speak any other language and settle there because they have some spanish ancestry or because it’s the easiest country to access thanks to the language. immigration to spain is not like that of the UK, USA, germany where millions of people settle there and work many highly educated and without any links with the country. look at the difference between latin americans in spain (mostly from one or two countries and poorly educated) with latin american immigrants to the USA (many highly trained, wealthy and many times even elites back in their homeland who go there as exiles. spain is a very corrupted, bureaucratic, still needs to modernize a lot type of country…..
One of the most unnecessary, environmentally destructive and aesthetically-repulsive was the “building boom” and the open door, Mulims-please come back policy of the Socialist government. Migration to Europe is nothing like migration to US or Australia, it’s poor Morroco or Africans/Latino people, not educated, some of them with criminal/drug smuggling/addiction records trying their luck to go abroad. I feel sorry for Spain, i love Spanish people, but some places looks more like Marracesh not actualy Spain, they lost control of incoming migration, keep on paying for their children, health care and school education, not getting enough for themselves.